About this time last year, I attempted to decorate Easter eggs with a friend. And they didn’t turn out so well, for a variety of reasons. So this year, when I saw a package of faux Easter eggs at the dollar store, I decided to give it another try! 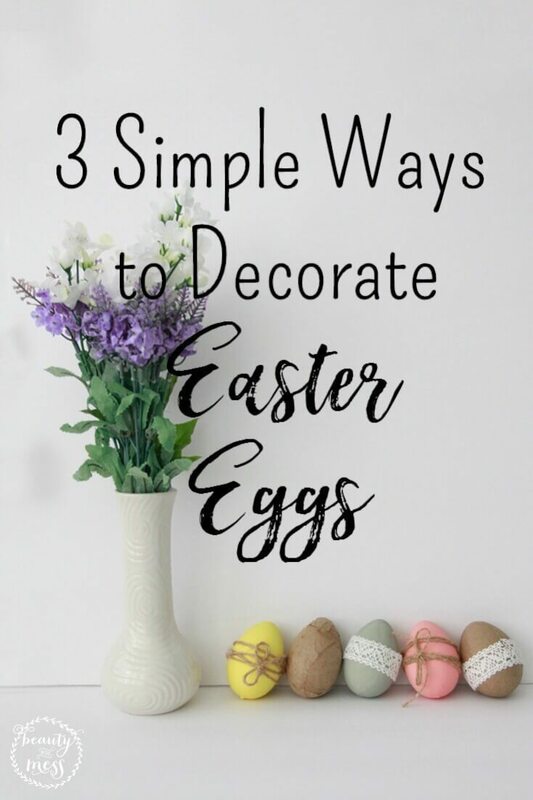 But this time, I tested out a few simple, no-fail decorating methods for decorating Easter eggs which I will be sharing with you today. 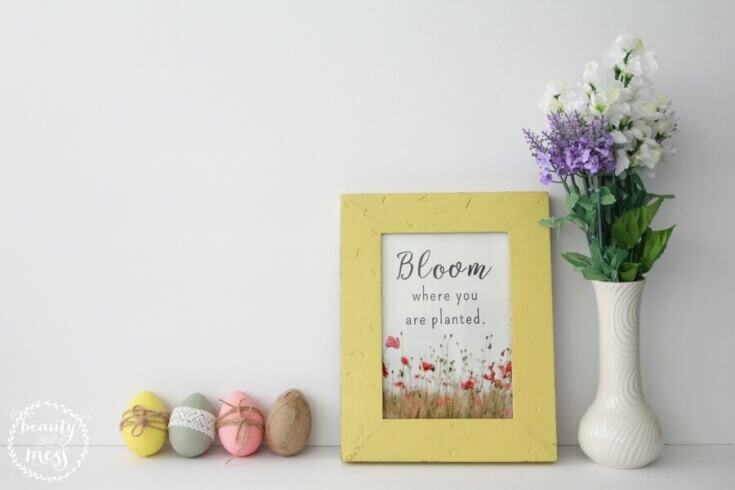 As a bonus, I also created a spring printable quote for you! Be sure to read through to the end to see how you can snag the free download for yourself. I discovered how much I love Mod Podge a few years ago when I used it to give my old nightstand a makeover with fabric. Ever since then, it’s been one of my go-to ways to spruce up any project, from furniture pieces to seasonal crafts. Here’s what you’ll need if you want to join in on the fun! Make sure you pick a paper or fabric that’s not too thick! Otherwise, it can be tricky to shape it onto your egg. I used brown craft paper for this and it was perfect! Once you’ve picked your paper, crumple it up a few times so that it’s not so stiff, and then cut it up into strips. 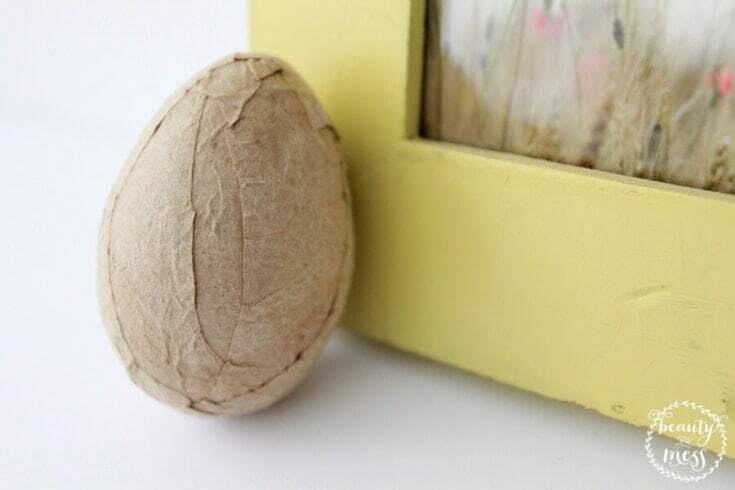 Finally, paste the strands onto your egg one at a time with a small paint brush and some Mod Podge. Incorporate a pop of color to your project by painting a few eggs. All you need to make this happen is a variety of acrylic paints and a paint brush! Get creative and bring in a few spring colors that match the rest of your seasonal decorations. 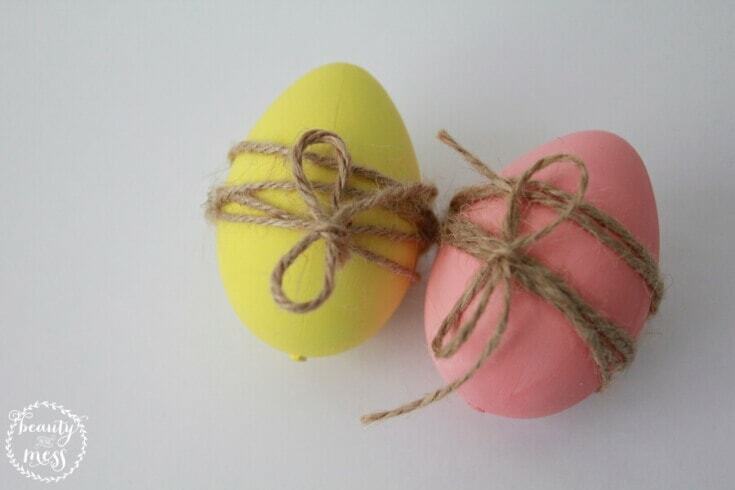 Once you’ve painted your eggs, wrap a long strand of twine around each one and finish them off with a bow. Voila! You’ll have added a unique and rustic touch to go with your Easter decor ensemble. I already have a slight obsession with lace, so imagine my delight when I recently found lace tape at the craft store. I originally bought it to use for scrapbooking, but little did I know that it was just what I needed for this project. 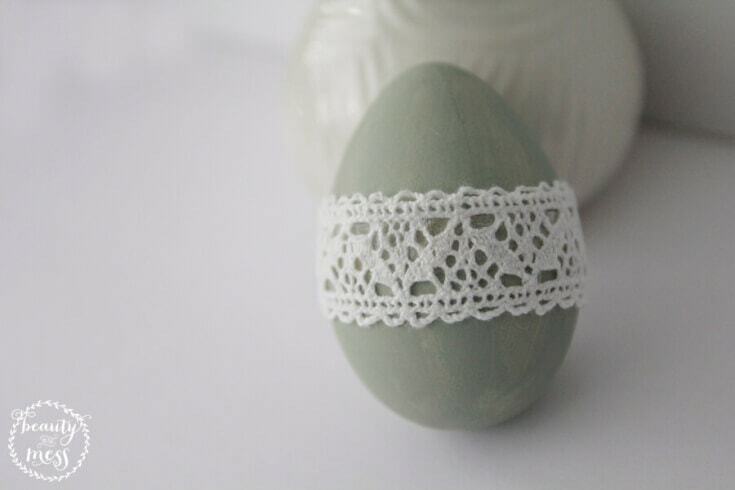 All you have to do is paint an egg and wrap lace tape around it. I had so much fun creating this little spring corner in my home! 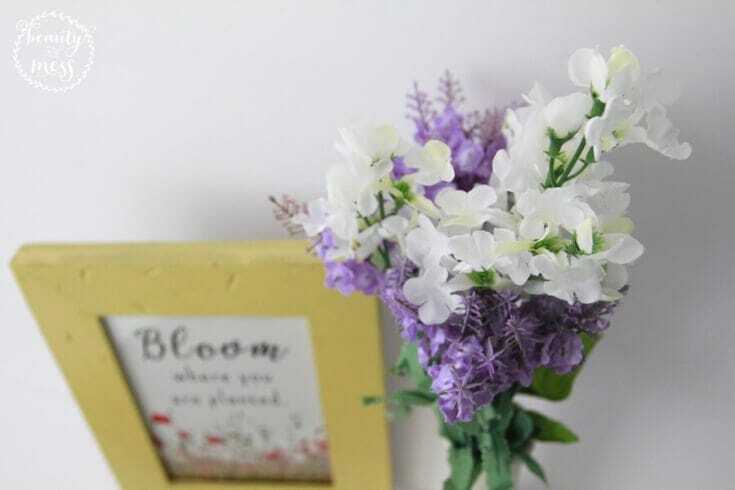 I am especially enjoying these dollar store faux lavender bushels. They are yet another budget-friendly find that completed this vignette. Believe it or not, I actually found this yellow picture frame at a thrift store a while back. I had planned on re-painting it eventually, but after I realized how perfect it would be with my spring printable, I decided to leave it as is. I chose this specific spring-themed quote to share with you today because it’s very applicable to the current season of my life. I’m excited to display it in my home over the next few months, and to have it serve as a daily reminder that I need to find joy right where I am. Can you imagine having this in your home, too? Grab a copy of this printable here! 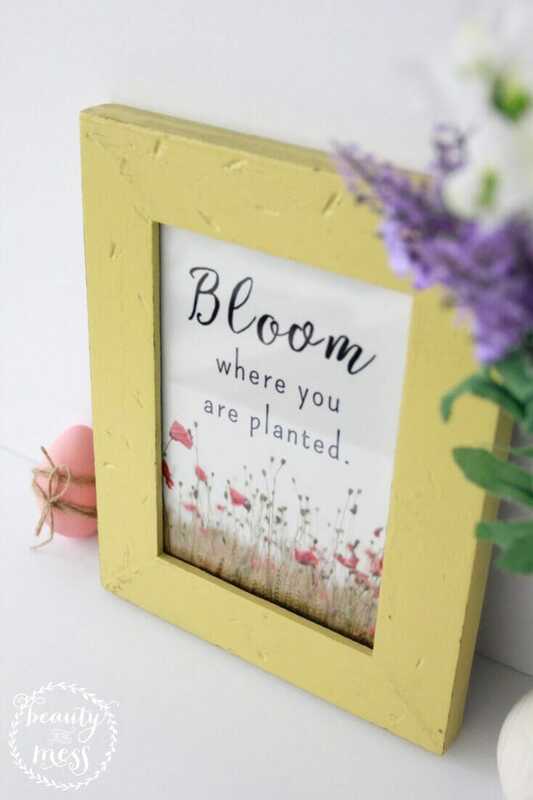 DO YOU NEED TO BLOOM WHERE YOU HAVE BEEN PLANTED? I absolutely LOVE the printable and the message is so timely for me as well. Thank you!